What is "This Old Church"? This Old Church is a fellowship where we meet around 10 AM to get things done around the church without having to contract it. It is usually the third Saturday of every month. Whatever the age, whoever you are, come and have a good time with us! Here is this month's calendar. CAL is a link to a calender for that day. I hope you enjoy these moments in time as much as I have reading church council minutes & the minutes of the building committee in 1912 & 1913. I will bring to you in a shortened version what I have read relevant to this building. 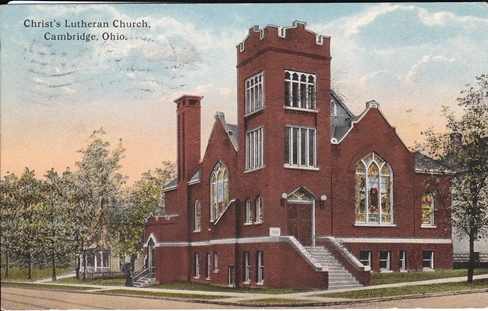 CAL Sunday, April 8, 1912, congregational meeting was held & voted to call Reverend R. W. Doty to Christ's Lutheran Church. His arrival would be in June 1912. CAL Sunday, July 7, 1912, congregational meeting was held & voted to relocate the church. CAL August 12, 1912. Building Comm. Question arose as to when to start building of the church. After discussion it was left undecided. Motion was made that committee of three be appointed to visit other churches, viewing plans of same & report to Building Comm. CAL August 30, 1912. Church Council & Building Comm. Voted to write check for $2,314.50 to be applied on purchase price of lot. Mr. Turner was asked to examine records regarding church lot. CAL September 3, 1912. Building Comm. Motion was made to purchase 40,000 bricks provided they could be bought for $10.00 per thousand. CAL October 14, 1912. Building Comm. Reported 40,000 bricks were bought & delivered for basement of church at $10.00 per 1,000. CAL October 29, 1912. Building Comm. Motion made that a check be drawn for $1,200.00 to be applied as payment in full on purchase price of lot. CAL December 6, 1912. Building Comm. At $.54 advertising for bids on old building to be removed on new church lot. Tenants of house on the new church lot were to vacate by February 1, 1913. You may notice I had to add the year "1914" to our building timetable. It has been a surprise to find just like the saying "the best laid plans of mice & men, often go awry". There has been a problem with bricks! CAL January 16, 1913: Bldg. Com. met at the office of Architect J. F. Orr to view building plans for the new church. After discussing the heating system, it was decided by motion to accept Hot Air heat. CAL January 23, 1913: Bldg. Com. again met in the office of Architect Orr to view plans, which he had drawn. Motion made & carried to have measurements of church 42 x 60 feet. Motion was made & carried to pay Architect Orr a commission of 2% for plans & specifications; and 1% for over-seeing the erection of the building. CAL February 3, 1913: Bldg. Com. met to further discuss plans of the new church. Motion was made to pay Branthoover & Johnson Co. $2.40 for work on sewer of church lot. CAL March 31, 1913: Bldg. Com. moved & carried that Mr. Townsend get into communication with Window Art Glass people. W. H. Patterson & Son agree to furnish all labor & material according to plans & specifications except excavating & seating for sum of $12,968.00. Allowing $11.00 Per 1,000 (M) for paving bricks now on the grounds. W.A. Blackmore agree to furnish all labor & material according to plans & specifications for $12,964.60 except seats, wiring & excavating. And allow $11.50 per 1,000 (M) for paving brick now on the grounds. People Plumbing Co. gave estimate on plumbing, heating, ventilating & gas fitting according to plans & specifications for $2,100. Cambridge Electrical Co. bid on wiring the church according to specifications for $288.00. After considering the bids as submitted, Com. decided to meet with Architect Orr April 11th & further discuss the cost of building. Moved & carried that we use common brick on East & North wall of Church. Motion made & carried to accept Brick No. 50 at $17.00 per 1,000 (M) & Brick No. 60 (light) at $17.00 per 1,000 (M) of the Hydraulic Press Brick Co. of Cleveland, OH for facing brick on South & West side of church walls. CAL April 14, 1913: Bldg. Com. met at Architect Orr's office. Motion made for secretary to write the Hydraulic Press Brick Co. of Cleveland, OH at once asking them to send a Representative here as soon as possible. Motion made & carried to reject all bids heretofore submitted & secretary instructed to notify all bidders to that effect. Motion made to enter into contract with F. C. Hanna by which he is to act as superintendent of erection & construction of our church at $4.50 per day. Com. will meet April 15th & sign contract with Mr. Hanna. CAL April 15, 1913: Bldg. Com. met at the office of Architect Orr for purpose of signing contract with F. C. Hanna. Mr. Turvey will obtain building permit for new church. Moved to get surveyor to survey church lot. Motion to accept steam heat. CAL April 18, 1913: Bldg. Com. was called to decide on when to start excavating ground for [the] new church. Moved to start excavation Monday, April 21, 1913. CAL April 23, 1913: Bldg. Com. met with Representative, McKay, of Hydraulic Press Brick Co. to receive prices as follows: First Quality Brick at $17.00 per 1,000 (M). 2nd Quality Brick at $12.00 per 1,000 (M). 3rd Quality Brick at $7.50 per 1,000 (M). A special concession of $1.00 per 1,000 (M) to be allowed on First Quality Brick. Motion made & carried that we enter an order for face brick for Building as follows: 35,000 more or less No. 50. 5,000 more or less No. 60. 80,000 cills (more or less) at $7.50 per 1,000 (M). Also 2 ton red mortar (more or less) at 2.5 cents per lb. and must be shipped F.O.B. Cambridge, Ohio. Motion made & carried that we give an order for 5,000, more or less, of the No. 60 First Quality Brick. Also enough of 3rd Quality Brick to fill out a car. Also an order for 1 bbl. mortar color. Moved that secretary grant an order on Treasurer each Sat. to pay the bills on excavating as they come due. Prices were submitted from the Bryant Art Glass Co. & Mr. Townsend was instructed to get into communication with other Art Glass Co.'s. As we begin with the month of May, 1913 we do not know the outcome of the bricks this month. CAL May 5, 1913: Bldg. Com. meet on new Church lot. Motion made to notify Hydraulic Press Brick Co. to send their Rep. here as we have rejected the brick sent as No. 1 brick. Motion made for Mr. Turvey to get valves and other connections necessary to attach the water. Motion made to telegraph Brick Co.
CAL May 6, 1913: Motion made that we reject No. 60 brick and insist on what we ordered. Moved & second to write Mr. McKay & notify him about brick. CAL May 7, 1913: Bldg. Com. meet. Motion made to accept bid from Hoyle & Scott for furnishing lumber & Millwork, amount $1,896.57. Motion made & carried to leave bids on Ironwork in the hands of Supt. Hanna, amount $225.00. Motion made to appoint Bates to get bids on hauling brick from cars. CAL May 12, 1913: Bldg. Com. meet at the home J. L. Turvey for the purpose of reading bids on Steam Heating & Plumbing. After carefully considering all bids, it was decided by a motion to let contract to Mr. Orr if his bid included storm sewer and if not give contract to W. F. Johnson. Amount $1,999.00. Motion made & carried to leave the stone proposition to Mr. Hanna. Bates was given power to enter into contract with lowest bidder for hauling brick. Looking forward to June to share more with you then. By CAL June of 1913, the dream of a new church building was becoming real: the congregation met to approve the taking of a mortgage to cover the costs that weren't already covered by cash on hand or promised gifts, and the council felt that it could begin preparations for the laying of the cornerstone. The council took a first "draw" of $7000 and approved a second draw of $1000 from the line of credit that had been established for them at Citizens' Savings Bank Company. The council asked Rev. Doty to invite other clergy to be present at the cornerstone laying, set for July 27th, 1913. In CAL August 1913, the Building Committee was searching for bids for plastering and roofing. As the iron and stone was still coming in, they had paid a partial payment for the iron. The committee had met with Mr. Longworth in regards to the painting and decorating for $400.00, to be painted in watercolors, but then decided to have him re-bid, as the basement specifications had changed. The committee decided to order a 600 lb bell and have it shipped ASAP. The committee also decided to pay the balance on the pulpit chairs that the Sunday School Classes could not raise. In CAL September 1913, the Building Committee was working hard to receive bids for all of the jobs. They had decided to contact electrical companies in nearby cities for bids as they had only received one from Cambridge Electrical for $233.00 for the wiring. Bishard & Pyles had finished the painting of the window frames, and submitted a bill of $27.75, but the committee had decided that they would investigate the work before they paid the bill. Mr. Longworth was the lowest bid for the painting and decorating at $425.00. They had decided that the Cleveland Seating Co. would do the seating in the sanctuary. M.L Hartley was chosen to do the roofing for $498.00. The committee had changed the plans for basement flooring in the kitchen hall and steps, changing it from cement to wood. They were also still seeking bids for the plastering, since Turvey & Bates was the only bid received. The committee also decided to dedicate donated windows to contributors by placing their names upon them. The year is 1913 and the day is the CAL 5th of November. The Building Committee is meeting at the house of J.L. Turvey. After appointing a subcommittee to consult with L.H. Slocomb in regards to the number of switches in the Midland Power & Traction Co. bid it was found that this bid was favorable and acceptable. Turvey will be employed as over-seer of plastering and other work at the church until further notice. After a VERY lengthy discussion it has been decided the bill presented by E.C. Johnson, Secy. for Bishard & Pyles for $27.75 for painting be allowed. It has been decided to pay Turvey $6.49 for muslin to cover the new church windows. It has also been decided to pay Rev. Doty $1.00 for demurrage on the brick shipment and $2.74 for the freight on the bell. After viewing the samples The Theodor Kundtz Co. sent of the finished wood for the new church pews the Committee decided to accept the finish. On the CAL 13th of November the Building Committee is meeting at the house of the Chairman, Chas Moss. The Committee has decided that the insurance on the church needs to be increased to $6000.00. A subcommittee composed of Bates, Johnson & Moss will call on Mr. Delaney to consult with him in regards to the plastering of the church. It has been decided to pay Turvey $4.70 for the stove pipe, broom and bucket. It has been decided to pay John Dean $6.00 for the rent of two stoves. Finally it has been decided to transfer $654.33 from the Building Committee fund to the Pipe Organ fund. This amount with the $95.67 now in that fund makes a total of $750.00 which is required by Carnegie as our half of the purchase price for a pipe organ. The necessary blanks will be filled out at a future meeting. CAL December 1913 has been a very busy time, as there were four meetings of the Building Committee. CAL On December 1, it was decided that we pay the $2.00 demurrage on a car of bricks. A bill of $1.00 is to be paid for the surveying of the church site. A sample of the windows sent by the G.C. Riordon Glass Co. of Cincinnati, Ohio, was viewed and unanimously accepted. Johnson is in charge of purchasing the chairs for the Sunday School and Choir. Townsend and Turvey are in charge of decorating of the church. Turvey, until further notice, is in charge of looking after and building the fire in the church. CAL On December 11, the Carnegie Corporation sent a letter offering to pay the last half of the pipe organ which totals $1500.00, but the offer is only good until the CAL December 31. Townsend is going to contact M.P. Moller with Pipe Organ Builders of Hagerstown, Maryland to ask him to send a representative here at once to make arrangements to install the organ, and to find out how long it will take to build. A bill for $17.65 is to be paid for coal, lumber and stove pipe bucket. CAL On December 16, a meeting was held to go over the contract and specifications for the pipe organ installation. The plan is to have to the organ installed on or about February 1st by M.P. Moller Pipe Organ Builders. Bates said that the specifications and stops to be installed in the organ should be left up to Townsends' judgment. Townsend advised the Committee the specifications and stops submitted by Moller would be the very best that could be installed to get the best effects for choir and congregational singing, because they can be regulated for solo work, even mellow and soft an accompaniment suitable to the smallest child's voice, and still be increased by Grand and Pedal Organ for a chorus of voices that would be possible to have in the church and still have ample power. The committee agrees with Townsend, and completed the contract. The committee agrees to pay W.H. Hartley Sons Co. $498.50 for roofing and metal work, and $3.00 for metal lathe for the tower to make the total $501.50. Frank Hanna will install the windows in the church basement without further delay. Longsworth will be advised to start the work of decorating the church, to complete as soon as possible. The final meeting for December was held on the 26th. Johnson reported that after meeting with Suitt Bros. of Cambridge, Ohio, he recommended the chairs for the Sunday School for $7.50 per dozen and the chairs for the Choir for $27.00 per dozen. It has been decided that we order 10 dozen large and 2 dozen small Sunday School chairs and 2 dozen Choir chairs. Townsend has written to the Moller Organ Co. insisting that they send a representative as soon as possible. A contract has been accepted from Arc Light Co. of Cleveland, Ohio for $250.00, plus 5% for the hanging fixtures, making the total cost $262.50. Johnson has written to the Architectural Iron and Wire Co. of Wheeling, WV, asking them to send an itemized account of the iron shipped to F. C. Hanna. The following bills are to be paid: W.A. Hunt for $63.30 for lath, and Orr Plumbing Co. for $500.00 as part payment on plumbing contract. The Architectural Iron & Wire Co.: balance in full on account for $54.20 less the freight. The Riordon Art Glass Co.: $500.00 as part payment on window contract. J.C. Longsworth: $125.00 as part payment on painting contract. J.F. Orr: $500.00 as part payment on plumbing contract. J.L. Turvey: $7.77 for coal. The Cambridge Light & Fuel Co.: $5.25 for gas bill. The committee also decided that if any of the donators of the windows were dissatisfied with the windows that their names will be removed and the Church will pay the cost of the window. On January 23rd, the committee was finally able to meet in the new church basement. It has been decided to have Mr. Hanna move the pulpit platform one step further out, but have the radiator in the pulpit remain where it is, but if too inconvenient for choir they will be disconnected or taken out. It was decided that an order be drawn on the treasury for 72 bushels of coal for a total of $7.20.